The Red Sea Cafe (670 East Broadway, Vancouver, BC, Canada, phone 604-873-3332) is an authentic Eritrean and Ethiopian restaurant located on East Broadway near Fraser street. The menu has a good selection of vegetarian and non-vegetarian items, with vegetables such as okra, kale, green beans, and cabbage, and meats including chicken, lamb, or beef (some of which is pictured below). 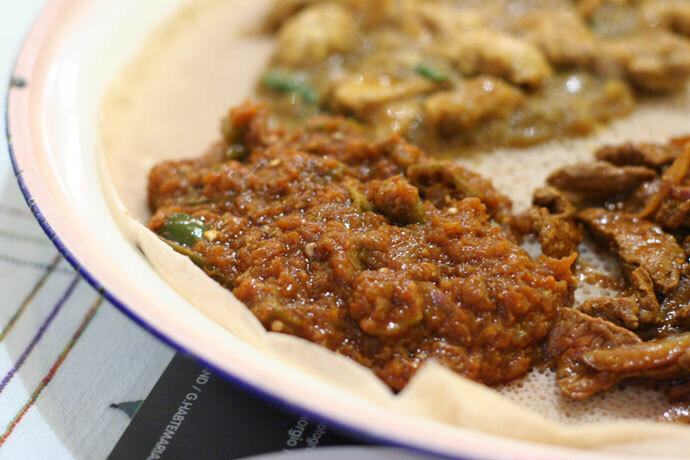 The stewed vegetables or meats are served on a spongy-like sourdough flatbread called injera. (Click here for more info about Ethiopian cuisine.) In the Ethiopian traditional cuisine, those enjoying the meal use their right hand to pick up pieces of the stew with the injera and eat without utensils. At the Red Sea Cafe you have the opportunity to eat the traditional way, or you can use a fork and knife if you wish. Prices are very reasonable: one serving of a meat or vegetable with injera costs around $8.00. If you are very hungry, they offer a combination platter for two to share, that has four items (around $15 per person, including tax and tip). I tried this restaurant for the first time the other day. I was really pleased with the ambiance. It’s so clean and peaceful. The food was fun to eat. Traditional Ethiopian cuisine – stewed meats or vegetables served on a sourdough flatbread. 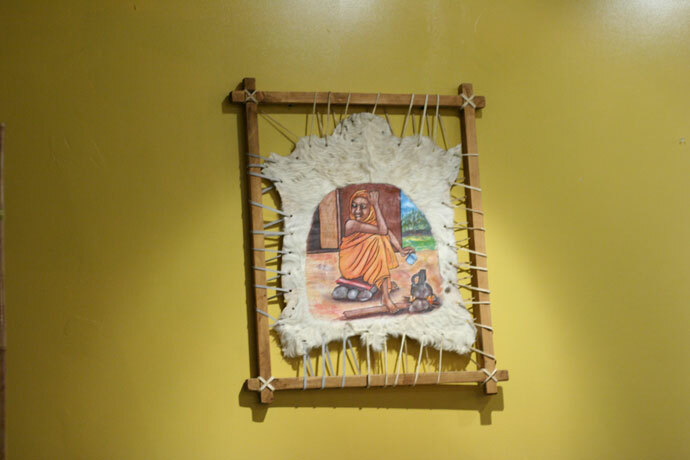 The decor of the Red Sea Cafe features some interesting art pieces from Africa. We hope you enjoy the great Ethiopian restaurants on Dine Out Here Vancouver.